Sweet and heat combined into a gluten free Asian flavored meatball made with maple pork sausage and extra maple syrup. These little gems make a terrific appetizer or entree. Serve over rice or in lettuce cups. This post is sponsored by the Ohio Pork Council. 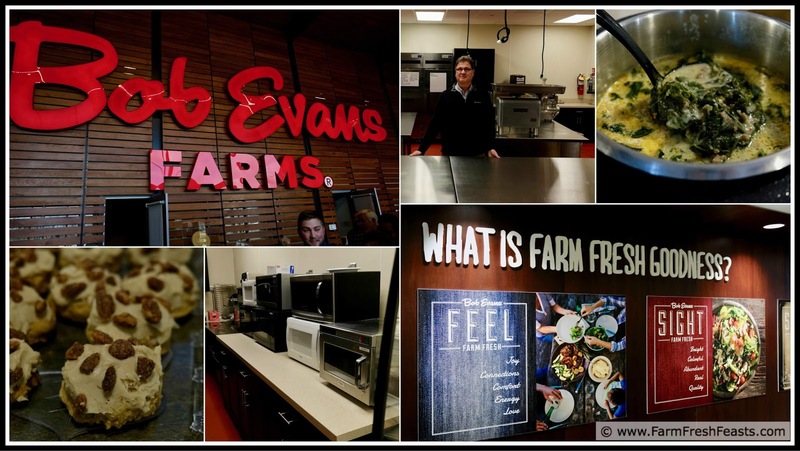 Recently I lunched with several Ohio farmers and bloggers at Bob Evans Farms corporate HQ. In addition to an easy recipe, I'm going to share my thoughts on the visit. First, it was very special to know that Bob Evans uses Ohio grown pork in their products, so some of the food we enjoyed could have come from animals raised by the farmers in the room. I like to support my local farmers and meet the folks who grow the food I feed my family. What struck me most about the day was the intersection of science and art that goes into our food. No, I'm not talking about molecular gastronomy (I'm not 100% sure what that even means). I'm referring to engineers working to produce soybeans that efficiently turn a piglet into my bacon. Sounds like magic, but it's science. Because of science, farmers like Phil Hord and Tom Graham can raise pigs to their mature weight of 270 pounds within 6 months. Tom feeds his hogs up to 6 times a day, and since he's showering in and out of the barn that means Tom's winter skin is chapped but his hogs are healthy and we're enjoying antibiotic free pork. Raising pigs more efficiently means folks like Nathan Schroeder, a 4th generation Ohio hog farmer, can come back to the family farm and make a living without needing an off farm job. Do you see all of those microwaves? When they say "Test Kitchen" they really mean testing! The side dishes and entrees are tested in a variety of microwaves to ensure the directions work for most machines. At the luncheon I learned more about the international work our Ohio hog farmers are doing. I knew from my visit with Mark Runyan of Oakview Farm Meats that Ohio hog farmers work with pork producers around the world. My first degree was in Animal Science, so when Rich Deaton mentions "genetic material" I know he's talking about frozen straws used for artificial insemination. That genetic material can travel all over the world. I didn't know that Tom exports young female pigs overseas. Ohio born hogs are creating dynasties to feed folks throughout the world. That's some pretty impressive science! This is a far cry from the hand crank sausage grinder that clamped onto our kitchen table. During our tour of the Bob Evans Farms Test Kitchen I was struck by the unchanged art of food. 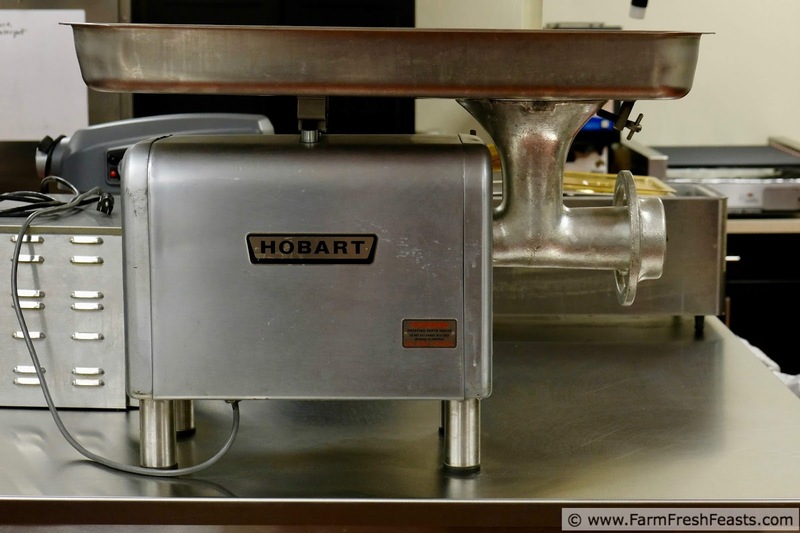 Steve Garber has been developing products for Bob Evans for 25 years, yet his sausage making technique is no different than my grandma's method for making potato sausage: combine the ingredients, fry up a patty, and taste it. (My Daddy wrote a story about making potato sausage for The Country Today.) Making good food remains an art, and Bob Evans' Emily is a true artist. She developed this meatball recipe that was the hit of the luncheon. Afterwards, we chatted about sausage and Basset hounds, and Emily helped me brainstorm how to tweak her recipe into the gluten free one I'm sharing today. Notes: I find meatballs have the best texture and flavor when the meat mixture is allowed to rest. I recommend chilling the meatball mixture at least an hour (up to overnight) before shaping and baking. Emily suggested making this recipe in stages--bake the meatballs (you can freeze them at this point). Mix up the sauce (ditto, you can freeze it). Thaw the pouches and heat in a slow cooker before serving. If you are avoiding gluten, be sure to use a gluten free soy sauce or tamari. To see how I made these meatballs, follow along with this quick video! Sweet and heat combined into a gluten free Asian flavored meatball made with maple pork sausage with extra maple syrup. These little gems make a terrific appetizer or entree. Serve over rice or in lettuce cups. Start by making the meatball mixture. In a medium bowl, gently combine sausage, egg, rice, and ¼ cup maple syrup until well mixed. For best results, chill for an hour or overnight. When you're ready to bake, preheat oven to 400 degrees Fahrenheit. 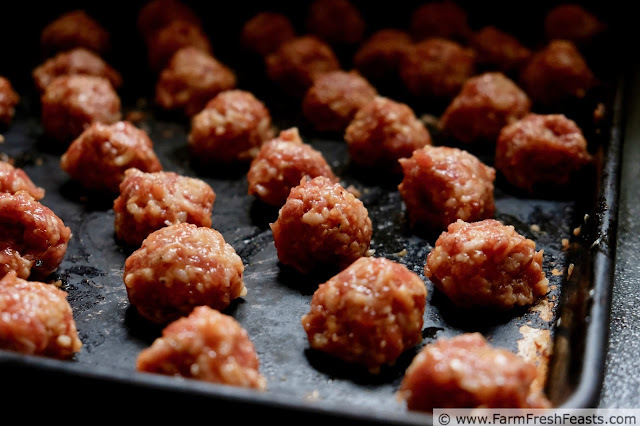 Shape sausage into small meatballs and place on a rimmed baking sheet. Bake for 20 to 25 minutes. Meatballs can be cooled and frozen at this point. When you're ready to serve, make the sauce. Stir remaining ½ cup maple syrup along with chili garlic sauce and soy sauce in a small (1.5 quart) slow cooker. Add cooked meatballs. Turn heat to Low for 30 minutes or until heated thru. Turn down slow cooker to Keep Warm setting for serving. I didn't realize your first degree was in Animal Sciences. I'm impressed and also with Bob Evans for sourcing local animals. This makes me happy. 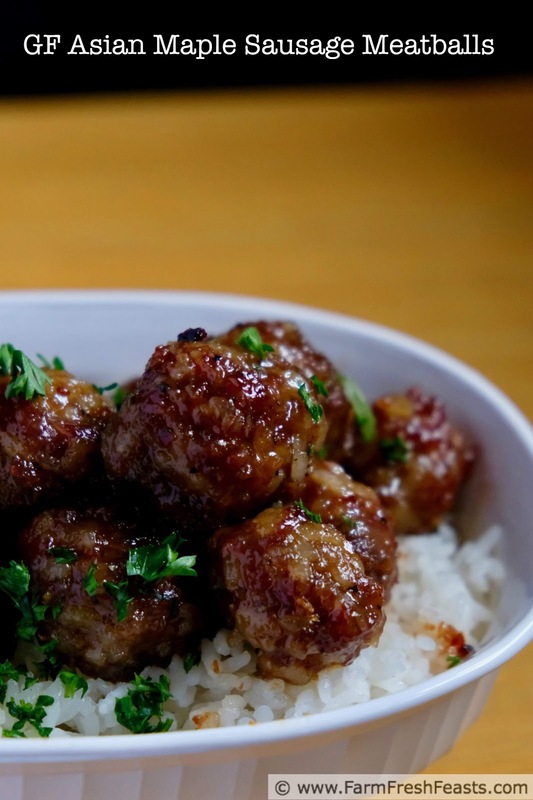 I have never had meatballs with the sweet and spicy flavor. 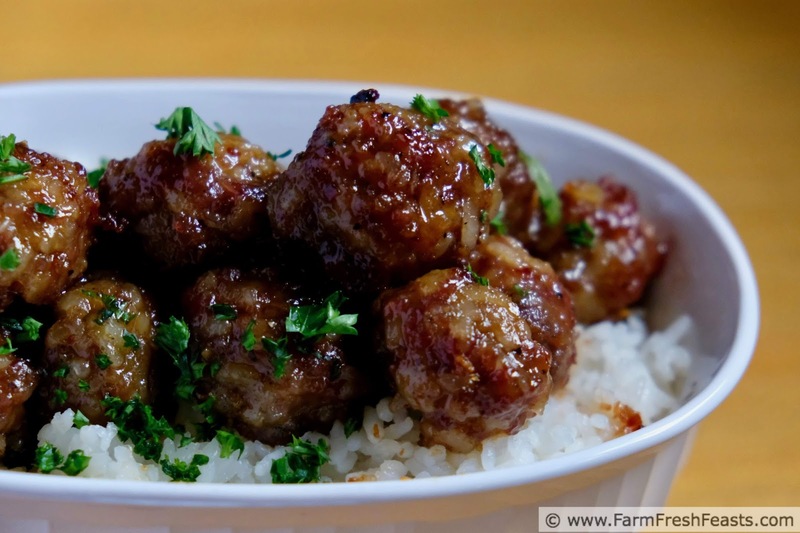 The glaze on the meatballs look mouth-watering! Can't wait to make this on my own. Thanks for sharing!